PREPARED BY OUR AREA CHEFS. 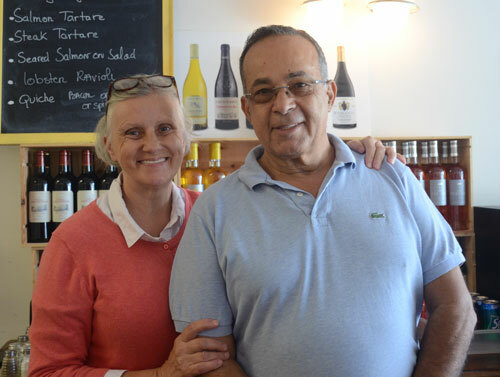 FACTS A popular eatery for over ten years, the couple started in SOMI at La Crepe Bistro on Red Road where they were for seven years, and then opened Café Bonjour on US1 & 62 Ave. Veronique is from Lyons and pastry chef Ahmed is from Morocco. Cook potatoes and French Green Beans for ten minutes in salted boiling water. Drain in colander and rinse with cold water. 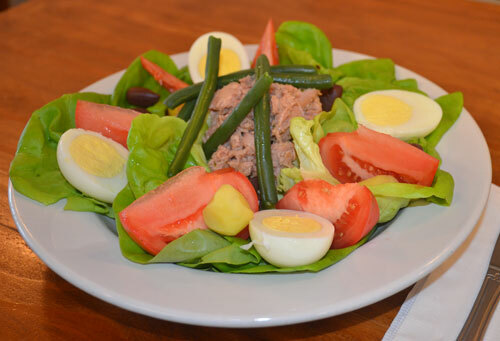 Put down the lettuce leaves and add tomatoes, olives, boiled eggs, slices of potato, beans and tuna on the top. Drizzle with dressing, season to taste with salt & pepper, and anchovies if desired.